The Royal Astronomical Society‘s annual National Astronomy Meeting (NAM) is the largest conference in the UK for professional astronomers. The location of the meeting changes every year and in 2014, the University of Portsmouth will be hosting the conference for the first time. While predominantly a conference for professional astronomers, NAM2014 will be accompanied by a full public and schools programme, ranging from talks to exhibitions to a comedy night. For more information please visit the pages listed below. The NAM2014 public and schools programme is being co-ordinated by Dr Jen Gupta and Dr Karen Masters from the Institute of Cosmology and Gravitation at the University of Portsmouth. 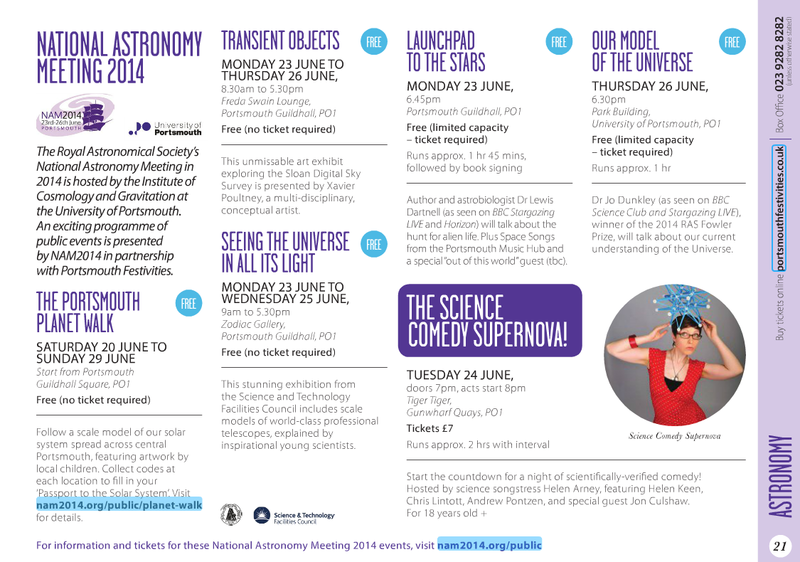 If you have any questions about the NAM2014 public programme then please contact them on outreach@nam2014.org. The NAM2014 public events programme is presented in partnership with Portsmouth Festivities. A summary of the public programme is below but please check the relevant webpage for the most up-to-date information. 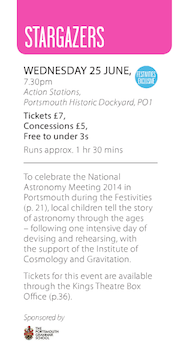 We are also helping with this event run by the Portsmouth Festivities in which local school children will work together to make a play about historical astronomy.